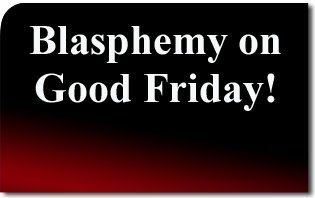 The American TFP > Anti-Blasphemy > Blasphemy on Good Friday! Our Lord Jesus Christ to be mocked on Good Friday by the blasphemous homosexual play Corpus Christi. Please join The American TFP in protesting the blasphemous play Corpus Christi that is scheduled for Good Friday, April 22, at the First Grace United Church of Christ in Akron, Ohio. You now have a unique chance to defend Jesus’ honor by peacefully, but loudly raising your voice against this horrible blasphemy. We protest – as we always do – in a totally peaceful and prayerful way. Also, please pass on this protest message to your friends and family. Above all, pray and offer sacrifice to the Sacred Heart of Jesus in reparation for this blasphemy.